Cocoa’s natural range spreads from Central America to western Amazonia. For centuries, smallholder farmers had grown cocoa in the shade of other trees, so the story went. But there’s no reason why cocoa can’t be grown in full sun once the delicate young plants are established. Large-scale farmers shade their young cocoa with banana plants or fast-growing legume trees such as Inga, which are then removed after a few years. Ecuador was my first experience with cocoa. I learned that shaded cocoa was “good for biodiversity”. The shade trees sheltered the birds on their flights between North and South America, but ornithologists were concerned about full-sun cocoa. There’s a lot of cocoa planted along the migration route. The debate between shaded and sunny cocoa sounded like a morality play, with traditional, small farms and their bird-friendly shade trees pitted against profiteering plantation agriculture. The grant proposal said that not enough was known about shade tree health. Better knowledge of their pests and diseases would protect the trees, the birds and biodiversity. Win-win-win. The real story was not so simple. Driving around the western lowlands of Ecuador, with Jeff Bentley and John Stonehouse, we soon realized that shade trees were astoundingly healthy. I had this uneasy feeling that we were studying a non-problem. We ploughed on, visiting 21 farms, interviewing the farmers at length about their shade trees. We wrote up our notes separately and the tree health specialist (me), agricultural anthropologist (Jeff) and entomologist (John) compared what we’d seen. Slowly some light emerged. We asked farmers why they grew shade trees though this wasn’t what we had set out to do. But I relaxed a little as I realised that we’d done what my colleague Harry Evans had called ‘wrong experiment, right results’. We were looking at shade trees in a naïve, but fresh way. 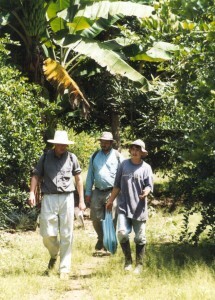 Early in our farm visits we noticed that many of the trees growing amidst the cocoa could not possibly be for shade. Orange trees, a common ‘shade’ tree, were barely taller than the cocoa. Coconut palms had small canopies that cast little shade. Few of the shade trees were survivors from the remnant forest, contrary to a popular stereotype. Most were planted by the farmers, whose main concern was making the most of the land. They grew trees in between the cocoa because it was possible to do so, not because they provided shade. The other trees increased their income through sale of fruit and timber. We quietly forgot about tree health. Our sponsors appeared happy with the results. 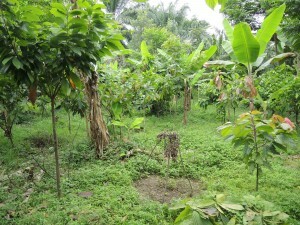 At the end of the study we decided that “shade tree” was the wrong label for the other plants that mingled with cacao. Shade was not their main function. Jeff suggested “neighbour trees” instead and that’s what we called them in our report. Seeing something from the farmer’s point of view helped to suggest new ways to reconcile the concerns of small and large scale cocoa-growers, researchers – and the birds. As the Ecuadorean farmers patiently answered our questions and showed us round their farms, we learned that the old cacao varieties grown among bird-friendly neighbour trees lived longer than full-sun cocoa and produced much tastier chocolate. Monocrops of modern, high-yielding cocoa hybrids need regular replacing – and lack neighbour trees. At the time of the study there was no premium for the bird-friendly, shaded cocoa. Buyers offered as much for insipid, full-sun cocoa beans as for the good chocolate. If the family farmers are paid what their quality cocoa is really worth, it is better for them, and for the birds. Boa E, Bentley J, Stonehouse J, 2000. Cacao and Neighbour Trees in Ecuador: How and Why Farmers Manage Trees for Shade and Other Purposes. Final Technical Report. Egham, UK: CABI Bioscience. Read the report.